The breeze is starting to hum a different tune and my ears are starting to tune in. Again. At long last, again. In the auto-tuned world that is modern fashion, I needed a bit of time to reflect. I’ve been speaking to and conversing with you in this space for a few years now and every once in a while, I need to step back from the noise, from the constant flow of imagery, from the bim, bop and buzz of the conveyor belt of information that I need to pay attention to in order to discover the things that speak to me. There were too many voices yelling at me on different channels (and in multiple accents) – ‘buy me, wear me, promote me, leesten to meeee, hear me, luv only me’ – and it all just blended into a vacuum of white noise. I needed to stop listening for a while. I needed to separate the pieces from what, for me, had become an ersatz whole. It had left a void, a hole. I needed to find my joy for fashion again. And while I have been paying attention to the numerous fashion weeks that have happened in cities all over the world since (I looked at them with only one eye, and from a distance); while the professional marketer and business strategist in me is acutely aware of both the designer and executive musical chairs that have been dancing in the daily headlines (if only I could turn that professional self off! ); I have tuned out the cyclical opinions of others. I have left the seasoned stylistas and the seasons behind. But I have had to go back, in order to come back. It is the teenage girl, in fact, that has brought me back. She, the 14-year old me, fell in love with fashion at first sight, with her first issue of Vogue. In actual fact, perhaps that issue of Vogue connected me with a love that was already there. It just somehow put that love into words – and pictures. Glorious pictures. It was she, with whom I reconnected over the summer months, without knowing I was doing so. It’s no secret that while I’m a digital girl by profession, I have a fondness for tactical media, too. I have amassed more than a few mags over the years. This past June, I decided it was time to declutter and let a few of them go. 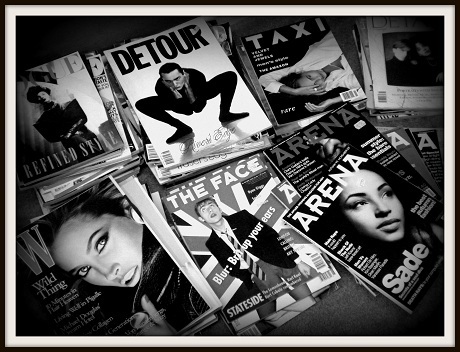 As I took them down from the shelf and sorted them into piles on the floor, I was reminded of editorials past, gushing at adored images that I had forgotten, recalling art, music and cultural heroes that had resonated once. It was a start. The mags I have amassed over the years. These made the cut. Then, fashion moments called out in films I watched again for the millionth time. For one, A Room With A View was playing here in Toronto as part of the Elegant Pairings series curated by James Ivory for TIFF Cinematheque. I hadn’t seen it on the big screen since 1985 and while I know almost every line of dialogue of this, one of my favourite films of all time, I had lost the memory of the perfect fall of the drapes in the drawing room where Lucy lies to George, had forgotten the eloquence of the Edwardian ensembles the women wore. 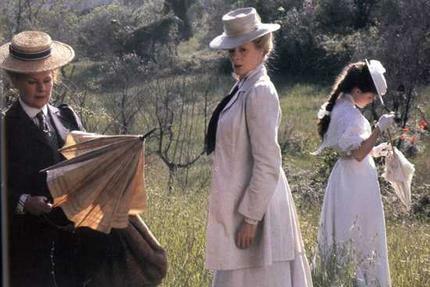 I had forgotten the smart jacket and tie on Judi Dench, the tip of the hat on Maggie Smith and the romance of young Lucy, portrayed by Helena Bonham Carter in A Room With a View. Bombay Talkie, one of the first screenings in the series and another film by the inimitable storytelling trifecta of Ivory, Ismail Merchant and Ruth Prawer Jhabvala, showed me India in 1970 and Shashi Kapoor in all his wide lapel fabulosity and youthful radiance. I had also seen the eyeliner on young Antoine and Carole in Jean-Marc Vallée’s Cafe de Flore in another era, held up the same records that Antoine (portrayed by Vallée’s own son, Émile) does in the film, listened to those same tunes. And maybe fashion was trying to sneak back in, too, through young Carole – known as Chanel Fontaine in real life. It is not lost on moi that Anne Fontaine directed a film entitled Coco Avant Chanel. Coincidence? As Cafe de Flore drives home, there are no coincidences. There is only fate. Come to think of it, George Emerson was also obsessed with fate. That – and the eternal question mark of life. 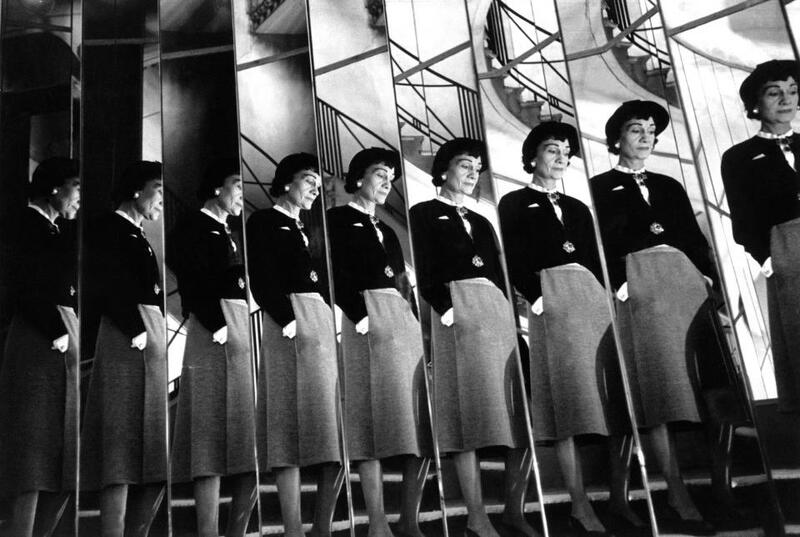 Coco Chanel photographed by Robert Doisneau, atop the famed staircase at Rue Cambon. I know I started this space because I have a sheer love of writing and a deep affection for fashion. For me, it has never been about the industry as an entity. It has never, ever been about generating PR for anyone. If you read about it here, it means that it genuinely resonated with me for one reason or another. It has not even been about the personalities (but oh, how I adore some of them). For me, it always begins and ends with the deliberate insouciance of a drape, the angle of a skirt, the fall of a pant, the crush on a cuff. That, is often enough. I have found that again. It is in the hand-finished seam of the Dries tunic I just purchased. It was in the violin serenade of gauzy gowns by Rohit Bal, a show which actually brought tears to my eyes. It was in the asymmetrical jewelled sash at Sabyasachi’s recent couture display. It is in the triumph of Kallol Datta’s show-stopping success. It is in the perfect curation of the racks at Philippe Dubuc’s new retail haven, Quai 417 in Old Montreal. It is in the font of Madame Roitfeld’s logo for her new magazine. It is in the spirit and emotion that reside in each handmade piece of Eina Ahluwalia’s Forgotten Jewel collection. I have not forgotten, Eina, but thank you for the reminder. Fashion is a part of me and has been a definite part of my past. However, my darlings, I don’t think I can separate fashion from my future. Images: 1, taken by Yours Truly. 2. Source. 3. Courtesy of Chanel.